How to rally Lv.5 Darknest is a lesson every rallier need to learn. 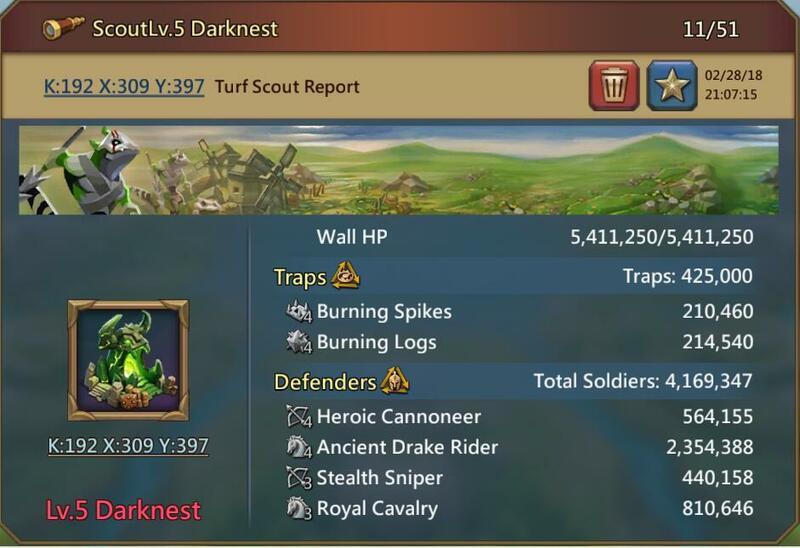 Therefore, I invited KKF omi425 to share his experience on rallying higher level darknest. The difficulty of rallying a darknest is positive correlated with the lvl of Dark Essence. With same troop types, lv23+ Essence has higher boons then yours. Therefore, you need to scout first, and then choose the Darknest that you can defeat to rally. 1) 3-type balanced troops are much more difficult than 2-type troops. 2)For 2-type troops: it's much more difficult if the type that counters the other takes the majority. (For example, there are Infantry and Cavalry in the Darknest, it would be much more difficult if Cavalry is more in quantity, you will need to send Ranged; and would be easier if there are more Infantry than Cavalry, you can attack it with full Cavalry ) . 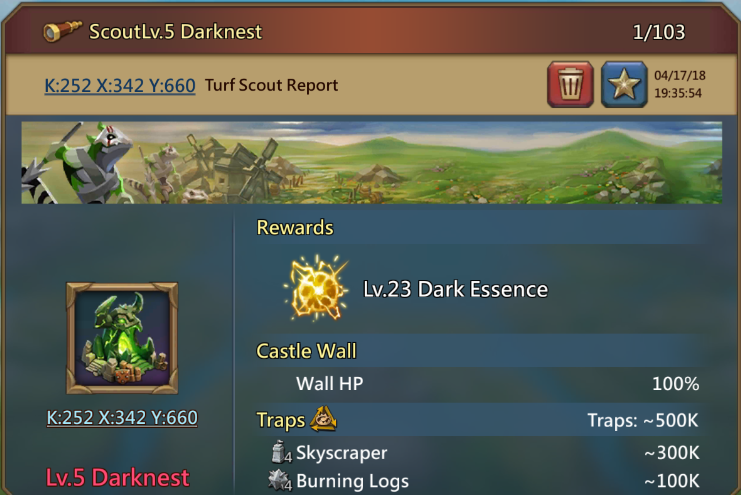 3) T3 and T4 mixed darknest will be easier than pure T4 darknest. Secondly, check the wall HP and the type of the Traps. Last, check which types of Heroes are deployed. The type of Soldiers is stronger if that kind of hero is more in quantity. For single type troop: Infantry is strong against Ranged; Ranged is strong against Cavalry; Cavalry is strong against Infantry. If there are 2 troop types, and the number of one type of troops is heavier than the other one, the deployment is similar to a single troop type. However, you will need to send the type of troop that is strong against the frontline, and the proportion depends on the specific circumstances. My suggestion is that only rally the Darknest that you are able to attack with one troop type. As the wall of the Darkenest is too tough, and multi types of troops will cause unpredictable Lineup change. Once the wall is breached, the troops of both sides starts to fight against each other, the fastest troops will be the frontline to tank the damage. For Example, if you used a Ranged lineup; ranged and cavalry to hit the wall. Once the wall is breached, your lineup will change to a Cavalry lineup. And if your battle relies on Ranged lineup, you will suffer severe loss. 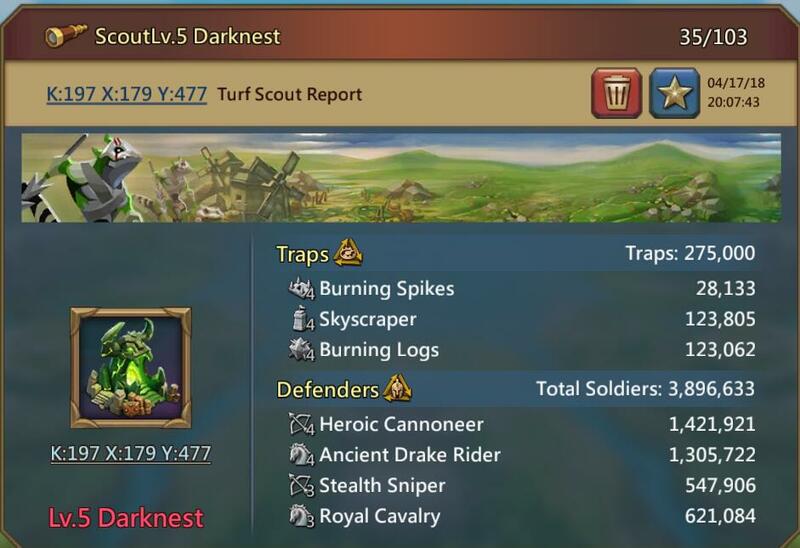 Darknest with Ranged and Cavalry . As long as you managed to get your Cavalry and Infantry all killed before the wall is breached, enemy's troops will come out to fight. And at that time, no matter what the original lineup the enemy used, it will change to a Cavalry one.